Great Bar friendly bar staff and smashing customers.The Bar is now under new ownership and has been completely refurbished.Take a trip down ,have a pint and something to eat and enjoy the friendly atomsphere . Have you got Google Earth on your computer? If so, then download the Google Earth view of Muldoons Bar. 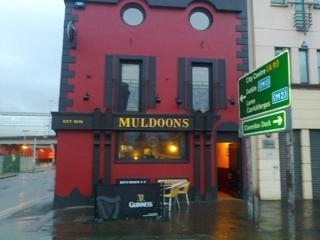 Is this the wrong position for Muldoons Bar? If you think so, then modify its position. Click / Tap the button above to get directions from where you are to Muldoons Bar. Was down last week for the first time. Had a great nights craic with beer and live music. A hidden gem!! Great wee hidden gem of a bar. Warm, friendly, cosy. Great bar, fantastic atmosphere, excellent food and drink,friendly staff and owners, well worth a visit - it will not be your last !!! Down on sunday for the football great criac with the lads man u win again. Half/time some great food provided by staff are friendly the pints are great will be back for sure. All the pictures of George Best are great and the Bulls Eye games that are played there are brill. Innnn One. The craic from uncle Albert who is a bar legend is great to. And you always find a friendly and helpful voice from bad Bob to. All the staff are very helpful.